Shinedown, the chart-topping rock band, continues to churn out hit after hit. Their latest album, The Sound of Madness, is full of singles that have been put on play nonstop around the world. Devour, Second Chance, and The Crow and The Butterfly are a few of the singles from The Sound of Madness that have recieved industry-wide acclaim. 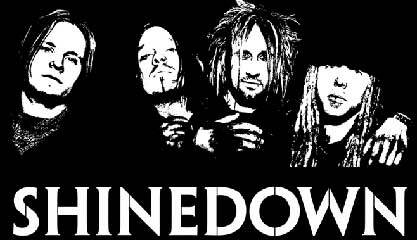 Shinedown was formed in 2001 in Jacksonville, Florida. Shinedown is Barry Kerch hitting the drums, Brent Smith vocals, Eric Bass strumming the bass, and Zach Myers on bass then lead guitar, back to bass and now again rockin the lead guitar. To date, Shinedown has released three studio records under the Atlantic Records label. Their debut album, Leave a Whisper, was released in July 2003. Leave a Whisper featured such hits as; 45, Simple Man, and Burining Bright. In October 2005 Shinedown followed up Leave a Whisper with Us and Them. Us and Them proved to be another success for the band. Us and Them included chart-topping singles Save Me and I Dare You. In June of 2008 Shinedown once again put out another hit album, the previously mentioned, The Sound of Madness. All together, Shinedown has 10 albums including deluxe editions, live sets and soundtrack contributions.